I feel like this week has passed in a daze, struggling to focus on what I'm doing from minute to minute, losing track in conversations, starting one task, getting side-tracked by another and forgetting what I started. It's been driving me crazy. This afternoon though I got to do farm stuff, nothing ground breaking, just feeding sheep, but I loved it. Simple straightforward in the outdoors, despite the number of gates I had to open and close and the return trips to pick up hats and drink bottles Muddy Baby Boy threw out the window, it was invigorating. It was also slightly depressing driving through paddocks with no feed, watching the sheep race toward you when they see the big yellow feeder bin on the back but I was out and about so I put that stuff aside. Somehow just being in the garden isn't enough, to drive over the farm and see the sheep and what's happening from block to block just gets straight to my heart and lifts me, that's what this afternoon did, despite the tiredness and crazy brain my whole mood was lifted and for that I'm grateful. 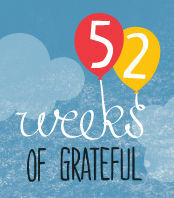 Linking up with the fabulous Bron over at Village Voices for 52 Weeks of Grateful. We have only a little feed too , it is hard when it doesn't rain. Praying for muddy puddles soon. I know what you mean.. farm chores keep me sane. Thanks for the glimpse into your world. It's so far from my own city reality right now, but it brings back dear childhood memories. Happy Mother's day! love getting glimpses into farm life - i adore the picture of the locked gate!! Good on you for getting out there Nat! It can be way too easy to just get stuck in that hazy feeling. I'm praying you get that good soaking you need soon too hun.